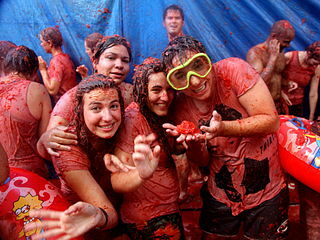 Spanish Festivals: Tomato Tossing, Flour Flinging and Wine Washing! La Tomatina: Not a Spanish fest for the squeamish. La Tomatina is the world’s biggest food fight! more than one hundred metric tons of over-ripe tomatoes are thrown in the streets. The small town of 9,000 grows to almost 30,000 as people flock to throw pulpy, sometimes smelly and always slippery fruits at each other. The festival has an unusual beginning, as it does not start until someone has braved a two-story greased wooden pole and snatched a ham at the top. Yes, a ham. However, as this is as hard as it sounds the festival often just goes on ahead. 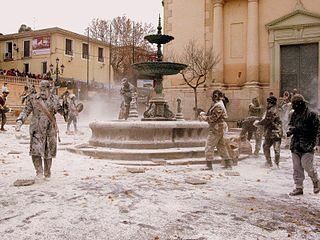 Els Enfarinats: The Spanish festival for fools and flour. Els Enfarinats brings flour to the people. Day and in the Alicante town of Ibi they take it seriously as this event is over 200 years old. A fake battle with the town council takes place with tomatoes (again? ), eggs, flowers and sausages and the council always loses. Anyone who does not obey the new laws of the fiesta is covered with flour and made to pay “fines” which go to charity. The town center becomes a foggy and happy cloud as flour fills the air and the revelers head on into the church square. Batalla del Vino: A festival to wear your wine and drink it too! 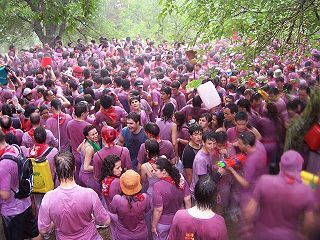 Batalla del Vino-a fun but tragic use of good Rioja! old quarters to shower each other with wine. Everyone turns to a beautiful shade of purple as adults and children alike bath in the luscious reds of the region. Almost seems a pity to waste! The festival has its roots not in religion but in a land dispute going way back in the 900s. As the years went along the dispute became less contentious and more libatious and La Batalla del Vino was born. Thankfully at the end of the day the celebration turns to eating and the actual drinking of the bounty of La Rioja. These are just three of the many, many festivals of Spain. Some are more solemn, some even more eccentric but all done with the whole-hearted passion that defines the Spanish people. If you’d like to discover them for yourself Conexus International can help. Our instructors and educators can guide you through our language immersion tours, cultural and study abroad programs and deliver an unmatched travel experience. And you don’t have to bring your own tomatoes! Contact us today to learn more. Those sound like a lot of fun! Messy, but still fun, and a great cultural experience. I have some new travel ideas for the future now. Thank you.